Raw Alkaline Cleanse Soup – Takes 5 Minutes & It’s DELICIOUS! This is my cornerstone alkaline cleanse soup – it’s a highly alkaline, energizing soup and is a big favourite while on the Alkaline Cleanse or just when I need a hit of nutrients and am short on time (sound familiar?). It takes five minutes to make, is raw, alkaline, anti-inflammatory, antioxidant-rich, nutrient dense and FILLING. You can also make 2x what you need and save a serve for later – it keeps in an airtight container in the fridge for 48 hours. The avocado and the spoon of healthy oils give you the fats to keep your energy high for hours, the fibre from the vegetables keeps you full and the cleansing properties of the cucumber, the antioxidants from the pepper (capsicum/bell pepper) delivers a hit for your immune system. It’s an awesomely alkaline soup and it’s a firm fixture for me – a foundational recipe – whenever I do an alkaline cleanse. 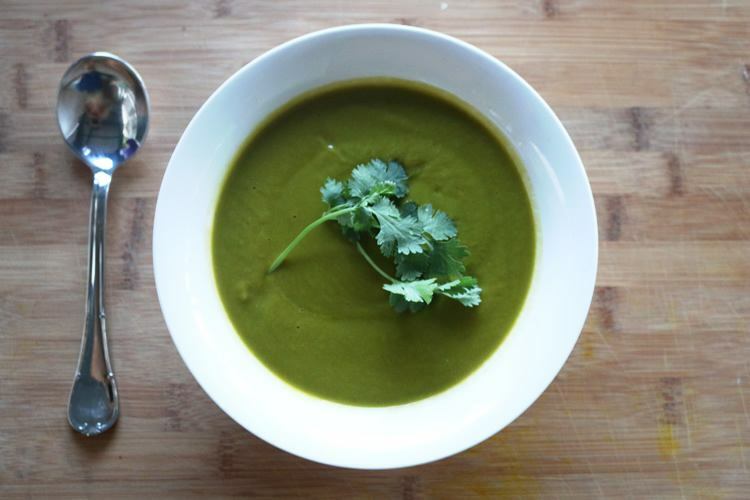 This is basically the original alkaline cleanse soup recipe – the staple. Blend the avocado and stock to form a light paste, then add the other ingredients and blend. Simple as that! If there is a particular ingredient you like, you can certainly throw it in here, feel free to swap, add, change, replace – just keep the core of the avocado, cucumber, spinach and stock. This soup can also be served warmed – it’s still raw. As long as it’s not so hot you can’t put your finger in and leave it there – that is still considered raw. My favourite way to make it ‘warmed’ is to use boiled stock/bouillon. OR if you have a Vitamix, you can follow their protocol for gently warming within the blender. It’s such an awesome delicious soup – I hope you love it! I absolutely love this recipe! It has become my favorite breakfast! Quick to put together, I have actually been able to end a forty year coffee addiction by having this wonderful Alkaline Cleanse soup at the start of my day. So happy to have found your website Ross! What if you are allergic to avocado? Yum Ross, this soup recipe is delicious. Just sitting down to enjoy my raw green soup for lunch! Delicious!! I also live in South Africa and would like to know what can be used to substitute Bragg Liquid? Thanks for all the wonderfull recipes! I am in such a wuandry as usual Ross. My whole gut/immune system has been literally pulled apart by this insane treatment. I have absolutely no bowel function and am starving and totally overwhelmed by parasites. I totally get why the alkaline diet I is so beneficial but I think I over did it without balancing things out because of such confusion with not knowing what was going on in my body. Since my immune collapse and absolutely no body support when I am at risk for cancer I have been suffering insanely and ripping out more parasites then you could imagine. With no bowel function I cannot get rid of toxic waste through my colon and this is insane. I have been told my diet is”too alkaline” I don’t know how to do things differently and now my teeth have all disintegrated so I cannot chew. I am in a mess Ross. Why do so many raw recipes call for Braggs? It contains excitotoxins. Wikipedia excitotoxins and Google Braggs for more info. It’s not good for you. HI , thanks for all the info. Today was my first day of starting the Master cleanse. and Im half way thru my day and already feel terrible. So I am opting out of it. Unfortunately, (not literally) something in my gutt kept saying this cannot be healthy. But like many of us, I chose not to listen to my gutt. But am today listenting to my body. I am an avid athlete and gained about 30 pounds in the last two years just from shear burnout and not eating right. I came across your information on the Alkaline diet (while researching info about the master cleanse lemonade diet), and I must say, sounds, and is, much more healthy. My question to you is, I am currently wanting to train for a fitness competition, does this diet include any type of protein, ei: egg whites, fish etc? I am having an alkaline breakfast and lunch but eating my normal food at dinner because I am worried of losing lots of weight.How can I avoid this? These are really simple alkaline recipes and it is part chance and part planned that most of them are heavily green based. The ones here are very green because a) greens are the most alkaline of all the veg and b) because these vegetables taste good in these recipes. Putting carrots, red cabbage, beetroot or pumpkin into this recipe simply wouldn’t taste so good. That is not to mean that these vegetables aren’t alkaline though! Almost every vegetable (apart from potatoes) are alkalising so eat them freely! You should eat a nice, wide variety of foods – don’t feel restricted! And I wouldn’t be doing my job if I didn’t promote my course here which comes with our Energise Alkaline Recipe Book (which has lots of non-green, treat meals) and a 12-week guided course which plans out every meal of every day for you, with weekly shopping lists that tell you just what to buy in order to cook each of these meals. And this is just one part of it. Why do all these recipes only have green vegetables? I understand they are the ultimate Alkaline source, but I thought any salad and any vegatable was adequate for the Alkaline diet-if one stuck to mostly non-green salad & veg will one still equally Alkalise or is dosing up only on greens the only way? « Top 7 Alkalising Snacks!